SOUTHINGTON – A New Britain man and a Meriden man allegedly caused a disturbance on a sidewalk downtown that lead to the damage of a glass door. 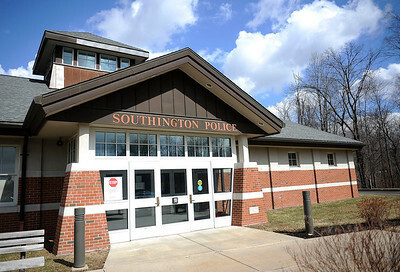 Michael Price, 23, of New Britain, and Gabriel Mendez, 30, of Meriden, were issued an infraction by Southington police for creating a public disturbance. Police responded to Center Street on March 16 for a report of a disturbance outside a restaurant at 75 Center St.
During the disturbance, one of the two involved, later identified as Price, was pushed into the door of Board and Brush, 61 Center St., police said. The shove caused the glass door to shatter. The two then fled the area, police said. An investigation resulted in the two being identified as Price and Mendez, police said. Price sustained cuts on his forearms and hand, and Mendez sustained a cut on his hand. Posted in New Britain Herald, New Britain, Southington Herald on Tuesday, 26 March 2019 20:43. Updated: Tuesday, 26 March 2019 20:46.